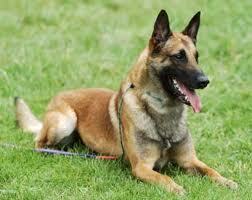 The dog is also used extensively by Unit Oketz of the Israel Defense Forces. Oketz favors the slighter build of the Malinois over that of the German Shepherd and Rottweiler which were employed formerly. Malinois are the perfect size to be picked up by their handlers, while still being able to attack their enemies and for their shorter coats and fair and neutral colors making them less prone to heatstroke, all these are advantages over the previously used dog breeds. A Belgian Malinois is believed to be the dog which accompanied the special forces unit which killed Osama Bin Laden on May 1, 2011.  from the Wiki post.